How do you write a family history everyone will love? It helps if you’re a stellar historian! But as Graeme Davison reveals, he can also learn from family historians, too. Graeme talks to Sarah Trevor about his new book, Lost Relations. When I look back, I’ve been keenly interested in family history from the outside, so to speak, for a long while. But I hadn’t really turned to writing about my own family. My father was the child of immigrants and his attitude was very much on the future. He said, “I don’t want to dwell on the past.” Some of that attitude probably affected me, and so for a long time I didn’t really think about it. My mother was, I realise now, quite interested in family history. When she died in 2004, the only things that I really wanted out of all her possessions were her photo albums. I’d never looked at them closely; when I did, I realised that there was quite a bit of history-making in the way in which she’d put them together. For example, at the beginning of one photo album, there’s a whole page devoted to pictures of the houses that the family had been associated with in Castlemaine and Williamstown, and there was a mysterious photograph of a house back in England. Those things, I suppose, gave me clues. Then, the particular circumstance that made me start to think about it much more actively was when my sister, who’s lived in England for 40 years, came out to Australia towards the time of her 70th birthday. She said, “I’d like to go back to Castlemaine”, which was the place my mother’s family had come from. It was then that I first began to look more closely, particularly into the story of Elizabeth Fenwick, a rather shadowy figure in the family. We knew about the Hewetts, who were a farming family from Hampshire, and we knew a bit about the circumstances of their arrival. But as for Elizabeth — who was the woman that my 2 x great grandfather, Robert Hewett, met on the Culloden — we knew little at all. It was really when I started to uncover her story the demon got hold of me. It just took over. The year I had planned to spend on other projects was completely consumed by this project. When I realised Elizabeth was actually one of the 38 needlewomen who’d come on the ship, and that these were young women who’d been rescued from the brink of poverty and possibly from falling into prostitution, that really touched me. The voyage of the Culloden is an extraordinary episode, and I was hooked. 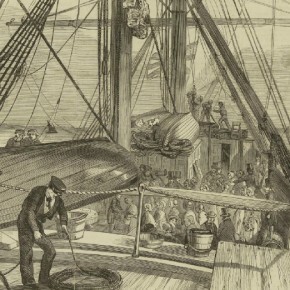 The Culloden set sail for Port Phillip in August 1850. Courtesy Allen & Unwin/Illustrated London News. Graeme Davison’s 2 x great grandfather Robert Hewett, who met Elizabeth Fenwick aboard the Culloden. Courtesy Allen & Unwin. 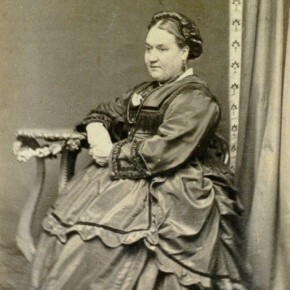 Elizabeth Fenwick. 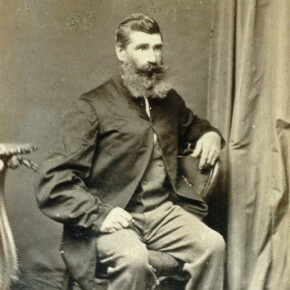 This portrait was taken in Bendigo in the 1860s. Courtesy Allen & Unwin. I was, in a way, approaching events and episodes that I’d known as an academic historian from a completely different vantage point. Now I was trying to put myself in the place of the needlewomen. It also meant that with those places I was very familiar with as a historian, I now had a connection with them through my family. They had been involved in things that I’d thought of as being remote from my own experience. I think it was that shock of recognition, that here were people who were connected to me as kin, who were the subjects of these historical processes that I’d previously seen at a distance and from the outside. That was important. I came to it as an academic historian and some of that’s important to the way I went about it, but I don’t think I’m doing anything much in Lost Relations that couldn’t be done by anybody else. If there’s anything distinctive about the book, it’s more the voice it’s written in — allowing myself to express the kind of quandaries that any family historian has when they come upon unexpected discoveries, or a gap in the record. I’ve tried to give an account not just of what happened to the family, but how I approached the voyage of discovery. I could not have written this book even five years ago, because of the sheer availability of sources like Trove or the 19th-century British newspapers, or the online records of British parliamentary papers and so on that were not online then. These searchable records are capable of finding those needles in haystacks that previously would never have been found. That, to me, has been a revolutionary thing. One of my messages not so much to family historians as to my fellow academics is that these new databases have extraordinary potential for the writing of social history. Simultaneously, in reconstructing the family story, I was also conscious of reconstructing the worlds they belonged to. I had a headstart, because I’d been studying those contexts for 40 years, so some of that is accumulated intellectual capital, if you like. But a lot of the more specific material has really only come to my attention through these digital sources. I’ve read a number of family histories and I’m enormously impressed with the quality of research that family historians do. Their knowledge of the techniques of genealogical research is certainly greater than mine. But sometimes they falter when it comes to trying to understand the significance of what they’ve found in the larger context. So I suppose if an academic historian brings anything to this, it’s not that they’re as good as family historians at genealogical technique or even at putting together the structure of the family, but they can perhaps bring something in understanding the larger context in which people lived. Often, that’s the clue to understanding why they acted as they did. We seldom get accounts, for example, in their own words of why people emigrated. The most you can do is to reconstruct their circumstances. That will bring you towards an account that can be much less conjectural, if you understand all the pressures that were operating on them in the society at that time. I have to now think of myself as belonging to a much more complicated line of descent than the one I had imagined previously. I suppose I’d thought that most of the forebears I’d known were Methodist, respectable folk. I now have a different picture of them. Read more of Graeme Davison’s story in issue 30 of Inside History.